New feature: Is it time for abortion to return to the political agenda? I take for granted the right to autonomy over my body. I have grown up secure in the knowledge that, should I ever find myself pregnant, the law is unlikely to force me to continue a pregnancy against my will. I am part of a generation of British women who look at the rhetoric of the debate around women’s healthcare issues in the US and count our blessings that we are so progressive that our ‘right’ to safe, legal termination of a pregnancy is not threatened. It seems that my complacency is shared. 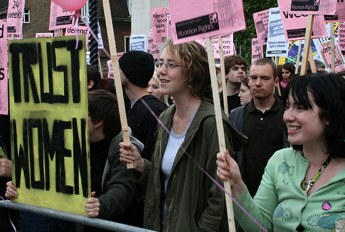 In the run up to the election – often described as the ‘Mumsnet’ election – there was little discussion of abortion. The Fawcett Society established the position of each political party on issues affecting women and did not mention it. We take for granted access to safe, legal terminations. In 2008, a series of challenges to the current upper-time-limit for abortions of 24 weeks was tacked on to the Human Fertilisation and Embryology Bill, I was gratified to see the overwhelming majority of MP’s vote the proposals down. But in an interview with The Catholic Herald two days after the General Election was called, David Cameron made sure abortion was a political issue again, with his renewed commitment to cut the upper time limit to 20 weeks. A pledge made as part of a ‘moral’ agenda which served to placate the Christian right, who have been busy establishing themselves within his party. His new Equalities Minister, Theresa May, has long since backed a cut to the time limit, and the make-up of the House of Commons has dramatically changed, with little information available about the views of new MPs on this issue.